The ranking table presented in this section provides selected demographic characteristics for Texas school districts. These data are based on the American Community Survey 2009 5-year estimates released December 2010. These are the first "richer demographics" for all school districts since Census 2000. 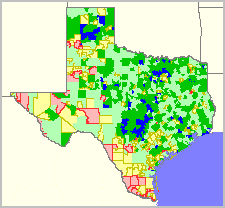 Data reflect school district geographic boundaries for the 2009-10 school year.